This is an excellent website and hope that we have lots of participants for many years to come. Thanks Janie, for putting this together. Professional Speaker, Bollinger! Love Janejude.com and great job getting NCCHS up and running. Any way we can email everyone registered, asking them to help us track down everyone else? With search engines, and just a little bit of info per person (company name especially), we can track down more of our class. and just follow the promps. Great job to all who worked on the reunion. I had a great time and really appreciate the opportunity to see everyone. I volunteer Voni Crowe for the 50 year reunion. To all that came to the reunion. I enjoyed getting around and seeing as many as possible. Many of you made me feel so humbled by the commits you made to me that night. I hope that is is not another 10 years before I see you again. AND to all that put this together and helped in any fashion,AWESOME JOB! Many thanks to all who worked and organized the 30 year reunion. Awesome job!!!! What a great night and it was great to see everyone. It was a special night that I will cherish for years to come. Hopefully we will get together again before another 20 years. Thank you to everyone involved in organizing and putting our reunion together. You all did an excellent job! It was so good to see everyone. I agree that we shouldn't wait another 30 years! I hope to see many of you often between now and our next reunion!!! Great job on the reunion. I had a wonderful time. It was good seeing everyone. As Janis summed it up, "We've held up well" ... and I must agree. :-) Let's keep in touch. Sorry I wasn't able to get back into town and attend the reunion........Great to see so many familiar faces through the pictures posted! From my family to all the Class of 79. MERRY CHRISTMAS AND HAPPY NEW YEAR. 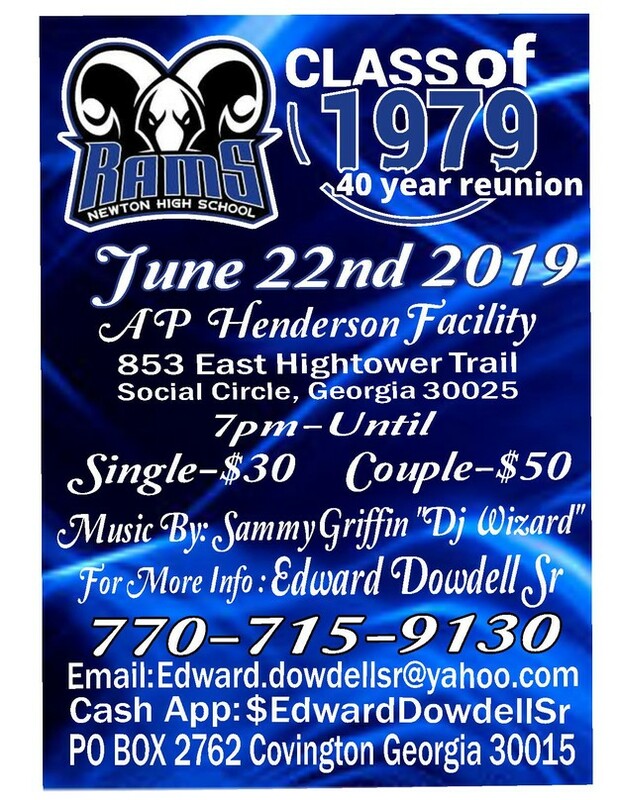 It have been 40 years since we graduated, so let’s celebrate this special occasion. We are trying to have a family day on Legion Field, so we have to plan for the event. If anyone interested on being on the committee email me Edward.dowdellsr@yahoo.com. Or call me 770-715-9130. George Galloway, Kenny Stokes, Sammy Griffin also POC. Ann Walton Laseter and I are in! Thanks for putting this together!! Unfortunately Sande and I will be out of the country on that date. Sorry to have to miss this, I would really love to see everyone and catch up. Count Rick Anglin and me in! Looking forward to seeing everybody again! Count me and my husband Maurice Carter in! Thanks so much for organizing this. Will try to make it to this special event! I wish I could be there. I will be out of the state for the month of June. Thank you so much for putting this event on.